Awhile back, I sat down to write about all our border crossings. Almost without fail, each one had it’s own drama to deal with. I never did get through writing them all, but I mined this one from that pile of first drafts. We almost ran into serious trouble trying to get into South Africa. It started at our embarkation point, Ezeiza, Buenos Aires’ international airport. We were checking out bags to Cape Town, when the person behind the Malaysian Airlines counter asked us if he could see our visas. No, we told him, we were planning to get them when we arrived at the South African immigrations. He began to grill us for information. Did we have return tickets? No, we were planning to continue our travels through Africa. How were we planning to leave the country? Did we have plane or bus tickets? No, we didn’t know how long we’d be staying and figured it would be impossible to buy South African bus tickets from Argentina, anyway. “Great,” I said. “I’ll be right back.” He motioned us to slide our bags off to the side so he could help the next customer in line. For that, I was grateful. It was a long line. I was about to head off to the nearest bank of ATMs when Oksana told me to hold on a minute. She was digging into her pack, pulling out one of the big bag of receipts and brochures we keep as cheap souvenirs or possible scrapbooking materiel. “Here you go,” she said. It was an ATM receipt, barely two days old, with the account’s remaining balance printed on it. We waited patiently until the attendant had time for us again. I showed him the receipt. He looked at it briefly, gave it a “good enough for me” shrug, and checked us and our bags into our flight. I didn’t realize then why he was being so careful, but I later realized that if we were not able to clear immigration in South Africa, as passengers on their flight, Malaysia Airlines would have been responsible for removing us from the country. One red-eye flight later, we both set foot on the African continent for the first time. It was early morning, so there wasn’t a long line at immigration, just the passengers from our flight. 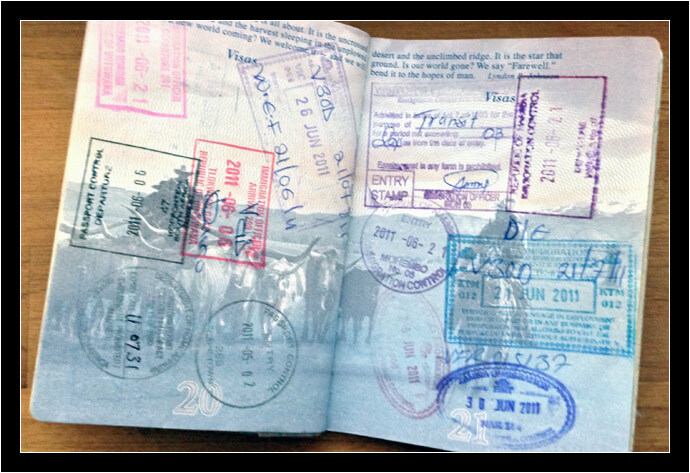 When it was our turn, we stepped up to the counter together and handed over our forms and passports. “What country are you arriving from? “Have you been to South Africa before? His face clouded; he was becoming exasperated. “I don’t know! But now they will have to take you into a room to ask you more questions.” He sat back and crossed his arms, letting that hang in the air. We put our smiles up against his scowl and waited for him to tell us where to go. He stared us down for another second or three and then said, “I don’t like this flight. It comes from too far away.” Bang, bang! He stamped our passports and pushed them across the counter. All depends on the personality holding the stamp!